Tastefully furnished apartment, in a condominium on the first floor with elevator, in quiet area along the Po River, at the foot of the hill, just minutes from downtown with free parking underneath the house and possibility of private parking. The apartment consists of 1 large bedroom (king size bed) with wooden floors, comfortable living room with sofa bed (1 bed), kitchen, spacious hall and a bathroom with shower, two balconies to exploit, remodeled recently in very peaceful and quiet area, convenient services, decorated in warm colors with careful attention to detail and fully equipped to provide comfort to the guests even for longer stays, HD TV, DVD player, magazines and books, Internet WIFI 20Mb, kitchen complete with fridge and freezer, oven and microwave, iron and ironing board, washing machine, 4 beds with sheets and towels. 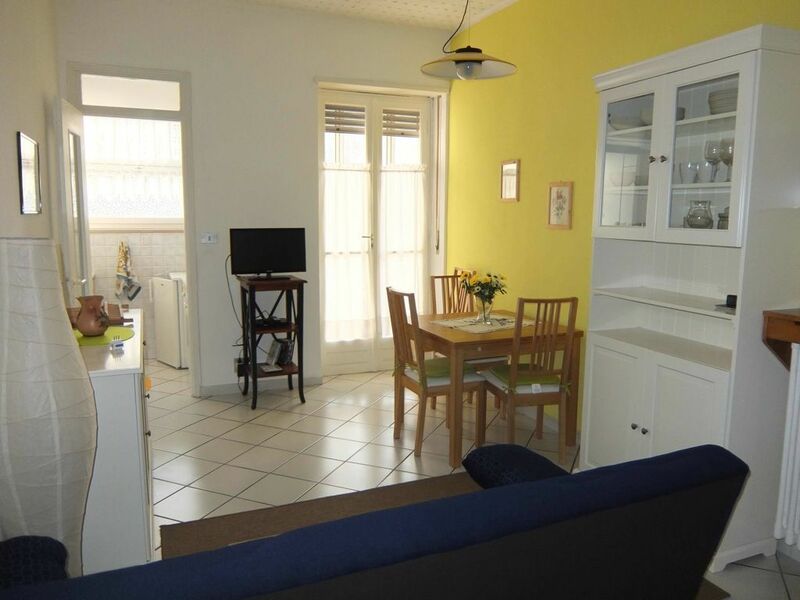 Convenient services, shops, street market, city park, ethnic restaurants in the area, close to Gran Madre, Villa della Regina, and convenient to the train to Superga. Perfect to visit the city without car and take advantage of the beautiful bike paths leading into the center or a short walk. Comfortable and practical apartment with excellent host! This clean, comfortable, well equipped apartment was a great base for our week in Turin. Christina was welcoming and professional host - many thanks for handling so well our late arrival! Everything we needed in kitchen for making our own meals. Very comfortable bed and useful washing machine for laundry. Easy access to trams to city centre, and a range of local stores and cafes just streets away. What more could you need? Many thanks Christina. Thank you Ruth. It's been really a pleasure to meet you. Great guests! Our home in Torino lovely and welcoming. Two weeks of bliss in a quiet residential area near the river Po. The river bank away from the city center is preserved in its natural beauty and offers a beautiful walking path Lungo Fiume, all hours of the day and evening. The Vanchiglia neighborhood is well connected to the city center with numerous and frequent bus and tram lines that are easy to navigate. Being able to leave the hustle and bustle of the city behind at the end of the day was relaxing. The flat is comfortable, nicely furnished and well equipped for anything one might need for a vacation stay - perfect for two. (The fold-down couch can serve for two more in a pinch. ) The elevator was helpful with the luggage, and the availability of a reasonably priced dedicated parking spot - served as an "insurance policy" - since every night while we had a rental car we were able to find convenient street parking. Cristina - the owner is friendly, helpful and available for chatting and advise. If you are not an Italian speaker - Cristina is fluent in English. We were able to pretend we were Torinese for two weeks. We hope to return to our Torino home in a future visit to the Bel Paese. Appartement très agréable et très bien équipé pour une famille de quatre. Le quartier est très calme en bord de Pô. Tous les commerces sont à proximité. Nous y reviendrons bien volontiers. Completely renovated apartment in mansion, quiet area along the Po River, at the foot of the hill, a few minutes from the center with FREE parking under the house but with parking PRIVATE chiusonel the courtyard. Perfect for exploring the city without a car, the Egyptian Museum, Palazzo Madama, Palazzo Reale, the Great Mother, Superga, Villa della Regina, La Venaria Reale, the Cinema Museum, the Mole Antonelliana, the historic cafes etc .. 'and exploit the beautiful courses paths that lead to the center in a short time on foot. La spesa di Euro 35,00 include pulizia finale, biancheria , consumi e tasse;il parcheggio privato al coperto con apricancello sarà di Euro 40,00 a settimana. Prezzo di Euro 10,00 a notte per ogni ospite aggiunto oltre i due.Tariffe scontate in relazione alla durata e in funzione del numero di persone, Deposito cauzionale per eventuali danni.Caparra richiesta alla prenotazione,. Consegna delle chiavi da parte del proprietario. Cancellazione e restituzione anticipo entro 30 giorni dal giorno dell'arrivo.